What do discounts really mean for us, accountants? The reason is that discounts directly affect measurement of various items in the financial statements and potentially the accounting treatment (timing and journal entries). In this article, I explain how you should treat the discounts from the point of view of both seller and buyer. My good friend, Prof. Robin Joyce added a bonus to this article. We try to explain why discounting is not always that great and how you should decide on the amount of your discount based on your own margins and sales. Maybe you’ll be surprised to find out that not every single business can afford discounting. Yes, it’s an expensive selling tool! When a seller provides a discount, it directly affect the amount of his revenue. Therefore logically, we should look to the standard IAS 18 Revenue or IFRS 15 Revenue from Contract with Customers for guidance. Both standards specify that you should present the revenue net of discounts. Just refer to IAS 18.7 or IFRS 15.47 and following). In other words, discounts reduce the amount of your revenue and do not represent cost of sales (or cost of promotion etc.). For example, when you sell a machine for CU 100 and you decide to provide a discount of 3%, then you present a revenue of CU 97, and NOT the revenue of CU 100 and cost (of sales, marketing, whatever) of 3. This rule seems very basic and very simple, yet its practical application can be challenging at some circumstances. Imagine you run an e-shop with books. To support your sales, you send a discount coupon for CU 5 that your customers can use with every purchase over CU 100. How should you account for the discount coupon? In this particular example, you don’t recognize a provision in your financial statements for a discount at the time of distributing a coupon. Because there’s no past event. Remember, a customer would have to make a purchase over 100 and only then you have a liability to provide a discount of CU 5. Instead, you simply recognize revenue net of CU 5 discount when a coupon is redeemed. Instead of giving discount coupons, you promise to deliver a book “Thai cuisine” for free with every purchase of “Thailand travel guide” for CU 50. You normally sell Thai cuisine for CU 10, its cost in your inventory is CU 6 and the cost of Thailand travel guide is CU 35. Under IAS 18, you simply recognize revenue for both books of CU 50 and cost of sales of CU 41 (35+6). Cost of free item is not a marketing or promotion cost in this case, because a free item increases revenues (supports spending). Under IFRS 15, the accounting treatment is the same if both books are delivered at the same time. However, if you deliver Thailand travel guide in September and Thai cuisine in October due to low stock, then you would need to split the transaction price of CU 50 based on the relative stand-alone selling prices and recognize revenue accordingly. Revenue allocated to Thailand travel guide: CU 50/CU 60*CU 50= CU 42 to be recognized in September. Revenue allocated to Thai cuisine: CU 10/CU 60*CU 50 = CU 8 to be recognized in October. Costs of sales are recognized accordingly. When buyers get discounts, it’s a totally different story. We need to look at IAS 2 Inventories, IAS 16 Property, plant and equipment or other similar standards for guidance. Both IAS 2 and IAS 16 prescribe that we should initially measure an item of PPE or inventories at its cost including purchase price. And, it’s net of discounts. However, let me stop here. You should examine the reason for getting a discount. If you receive a discount as a reduction in the purchase price of inventories, then you should deduct it from their costs. When discounts refund some selling expenses, then these discounts are not deducted from the costs of inventories, but treated as income. Another consideration might relate to settlement discounts, i.e. discounts received from quick payment. They should not be treated as finance income, but again, they reduce the cost of inventories. If the supermarket intends to pay within 30 days, then it should reduce costs of inventories by settlement discount, too. Contribution for leaflet printing costs is clearly refunding some selling expenses and therefore it should be treated as income, not as cost of inventories. The costs of inventories is: CU 5*1 000 – CU 5*1 000*(10%+2%) = CU 4 400. What about inventories received for free? If a government (including governmental agencies) donated you some inventories, then you should apply the standard IAS 20 Accounting for Government grants and Disclosure of government assistance. If you received some units of inventories for free as a “gift” with your purchase, then you should apply the standard IAS 2 – i.e. measure inventories at cost. For example, you purchased 1 000 units at CU 2/unit and received 50 units for free, then you record 1 050 units at CU 2 000, i.e. CU 1,90/unit. I have also seen that some companies record free items at their fair value while a credit entry goes in profit or loss (as an income). However, this approach is not supported by IFRS. In any case, you should always seek the substance of a transaction and then make appropriate decision. Let’s take a different angle of looking at discounts. My friend, Prof. Robin Joyce helped me with that. Discounts represent a very powerful selling tool, but at the same time, they are like marketing’s nuclear weapon. The reason is that discounts can lower price perception permanently or make your product a commodity. It means that clients will see no difference between your product and other products – they will just buy the cheapest (not necessarily the best). What do discounts do to your profit? 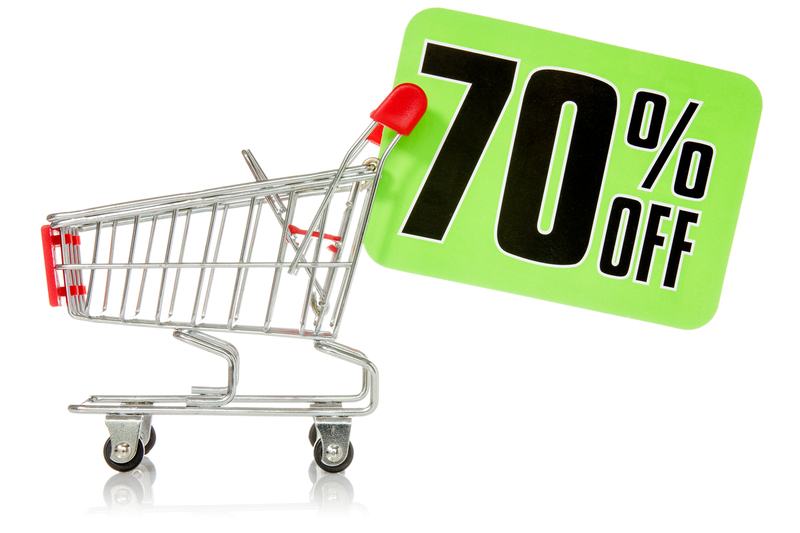 Do you really need to discount your products or services in order to increase your profits? If you sell some tangible products, then you need to know the exact financial impact of your planned discounts on sales and the net profit. This table shows you how many additional items you should sell at your present profit margins, if you want to keep the same profit. 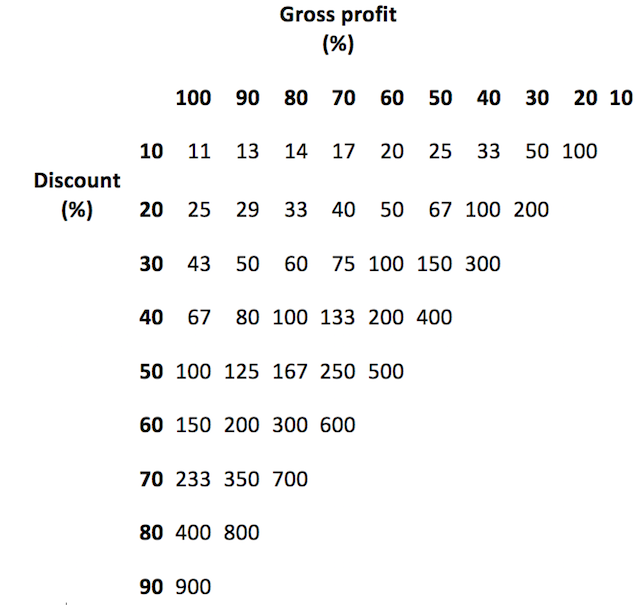 For example, if you are making 80% margin (top row), and you provide a discount of 20% (side column), you need to sell 33% more units to get the same financial result as without giving a discount. Let’s say you sell a product for CU 100 with 80% margin, therefore its cost of sale is CU 20. You sell normally 100 units, therefore your gross profit is CU 80*100 units = 8 000. You’d like to give a discount of 20%. Looking at a table above, you need to sell 33% more units than before to have the same effect. For verification, your new discounted sales price is CU 80, therefore your gross profit with 33% more units sold is CU 60 (80-20) * 133 units = 7 980 (Cu 20 is a rounding difference). This table assumes that you provide discounts for all your units sold, not just some of them (in this case, you would need to adjust the calculation). You need to know your gross margin before considering a discount. You need to know how many additional units you need to sell after discount to keep the profit. And, are you able to do so? 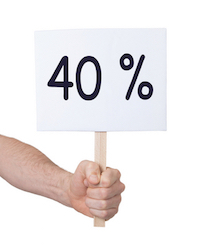 Will your customers really buy 33% more with 20% discount? If you operate with low margins, you cannot afford any discount. For example, if you operate at 10% margin, you cannot give away any discount without hurting your gross profit. You simply cannot sell enough items to pay for it. It’s your turn now! If you have any questions or concerns with regards to discounts and their accounting, please let me know in the comments below this article. Thank you! “If you received some units of inventories for free as a “gift” with your purchase, then you should apply the standard IAS 2 – i.e. measure inventories at cost. If you debit Inventories should the credit be to revenue? If it’s difficult to measure at cost, would you measure at FV or NRV? no, you don’t normally credit revenue and you normally don’t account inventories at FV or NRV upon initial recognition – you should do it at cost under IAS 2. In my short example, you allocate the total amount paid of CU 2 000 to 1 050 units of inventories, i.e. one unit will have a cost of 1.90. Debit Inventories CU 2 000/ Credit Suppliers CU 2 000. In other words, you do NOT account for free 50 items by debiting inventories of CU 100 (2*50) and crediting revenues – this is NOT supported by IFRS. S.
Moiz, I have no idea at what units you sell your products, but in fact, CU 10/110 g lowers your unit price per gram (if you do it in grams). It is very difficult to assess, as the information is incomplete. S.
for this illustration: Are my to Credit suppliers or Credit cash/bank? Hi, it is a nice article. I have one question regarding discount offered by start up companies. Let’s for example, one company is into selling of e-books and company gets 20% margin as commission for selling books online. lets in normal course, company sells a book worth $100 and earns commission i.e. $ 20. Company in order to promote business started giving discount 30% to general public. Hence, company net loss in this example is $ 10. ($ 70 selling price and cost $ 80 towards author. In this example, whether company will record commission at $ 20 and discount $ 30 or direct promotion cost of $ 10.
in this case, the company should record the revenue as received, i.e. USD 70 (net of discount). The author’s fee of USD 80 is recognized as an expense. However, this applies only when a company acts as a principal, and not as an agent of author. For more information about agency relationships, please read this article. Kind regards, S.
wow wow wow! I feel good to know that me and my colleagues are doing the right thing , even though, many atimes, we ‘ve had to brainstorm, share Knowledge on the requirement of IFRS when faced with issues treated today.Thank you silvia, thank u thank u thank u. You are doing a wonderful job here . I thank you for a nice comment 🙂 S.
Thanks, Silvia. Please how can I get that book; IFRS in 1 day? Thanks a lot. Deaer Ese, I’m sorry, the IFRS In 1 Day is not sold separately anymore. S.
1. If we record the free goods at zero value then it will reduce average cost of the inventory over a period of time. 2. Sale person can offer more discount if he is not aware of the situation by seeing the big difference between Selling Price and Cost Price. Keeping in view is it correct to show the zero value goods at last purchase price and adjust the amount in cost of goods sold. 1. You do NOT record free goods at zero value when you receive them together with “normal purchase”. 2. You should have some management reporting system where your sale person could see how much your inventory costs in average per piece. 3. You should look to your total inventories of the same kind as to overall stock, not individual pieces. You don’t have 1000 units at CU 2 each and 50 units at CU 0; instead, you have 1050 units at CU 2 000 in total (that is CU 1.90 per unit). This is fair – because, your real acquisition cost was CU 2 000 for 1 050 units. Is it permissible under IFRS to record these free goods at normal purchase price and adjust this through the Cost of goods sold. By doing so my average cost price will not fluctuate with receipt of free goods. The free goods I am getting is like a purchase discount in the form of goods instead of cash. The free goods given by our supplier is not a marketing support. Rohit, could you draft your journal entries? How would you like to adjust cost of sales? I suspect it’s not OK. S.
Rohit, no, this would not be correct. You cannot credit cost of sales at the time of receiving free goods – it makes little sense. S.
No, Luisa, that’s not right. Please read my explanation above. Or, please provide IFRS reference for your suggested treatment. 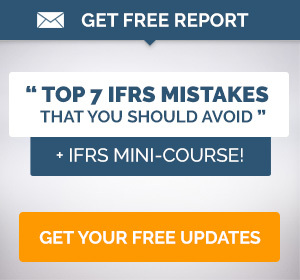 I believe IFRS do not support it. S.
Assuming that a company grant a $1 coupon to the customers for purchases over $100, and with the coupons, they are allowed to participate in a draw where the customers have a chance of winning a prize (i.e a car or even a property unit); the higher the value of the coupons accumulated, the more valuable are the prizes that they are entitled to draw a lot on and the company tends to give away the prizes regularly. In such a case, should the costs of the prizes be deducted from revenue, or be shown as cost of sales or simply as promotion costs under IFRSs? I would say that this time, it’s simply a promotion cost, because the particular prize (car…) does not support a sale of one particular unit (like buy a computer and get a printer for free), but promotes total sales as such. S.
Your posts have been of immense benefits to me each time. Just a little clarification, please. I would like you to please clarify if the above on Discounts have to do with Cash or Trade Discounts. I used to think that disclosing net revenues only have to do with Trade discounts should while gross revenue should be disclosed in the case of cash discounts. The discount given should then be expensed. Kindly throw more light to this. Well, let’s make it clear – by cash discount, you mean a discount for prompt settlement of an invoice, isn’t it? In this case, you should deduct it from the revenue and not present it as a finance cost. I think in 2004 or so, IFRIC dealt with this issue and agreed that settlement discounts should be estimated at the time of sale and deducted from the revenue. S.
Dear Silvia,what if the customer does not take the discount after it has been estimated at the time of sale,for example,say we sell item for C100 currency unit and we estimate a settlement discount of CU10 within 30 days,and the client does not take the discount,it was a credit sale,with immediate delivery,When the the payment occurs,how shall we recognised the forfeited CU10?Thanks. My question is not related to this topic. 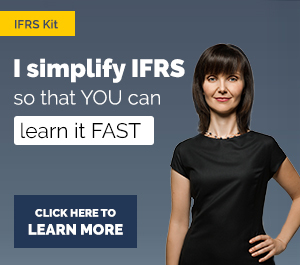 My question is if I buy your IFRS Kit, will I be able to learn all the latest developments like IFRS4 IFRS 9? or do you release these developments in timely manner? in general, I update my materials, so yes, e.g. IFRS 9 is fully updated, but please, send me your questions related to the IFRS Kit by e-mail, because the comments stay here forever and the answer may change time to time 🙂 Thank you, S.
Thanks for this article and various contributions towards enhancing readers knowledge of IFRS. 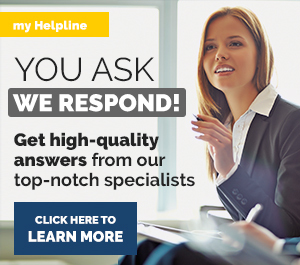 I will be glad to receive your support in answering the following question. What about Commissions given to Dealers? A company is selling both to Direct Customers and through Dealer Channels. 1) In case of Direct Customer Sales- the company gets CU 100 as price. CU 8 is given to the dealer as Dealer Commission who facilitated the sales. 1B) There is a further commission of 8% if the total annual sales exceed certain limits. 2) In case of sales through Dealer Channels – the company sells the goods at a price which is already reduced by CU 8. The further 8% commission (now termed as Discount) still exists. Many Thanks for the article. I had some issues with recording free items delivered when ever i make a purchase from most of my suppliers. This article has cleared all my doubts.Keep up. Ques: I know that trade discount will be deducted for the cost of inventory. However, I do not know what is the justification to account “settlement cost” as a reduction for the cost of inventory because the said reduction is subjective. I have seen some people accounted this as other income contributed as business income. just to be clear – you’re writing about settlement or cash discounts (for promt payment of invoices), right? I want to ask you about the question which talked about the rebates on inventory, you said that the settlement discount treated as a reduction in cost, but I think it must be treated as a purchase discount if we use the Gross Method and as a reduction of cost if we use the net method. you should treat the settlement discount (if known) as a reduction of inventory’s cost, i.e. purchase price. S.
So I have regarding free items. I understood scenario 2, where you talk about buy 1 get 1 free transactions. However, if a customer were to purchase 10 items, and receive the 11th item for free, would the accounting be the same or different? The cost of the inventory is not known; only the selling price is ($15 to $70 a unit). Also, only 60% of store customers use this loyalty program, so I was wondering if that plays a factor into accounting for the transaction. Dear Ryan, yes, the accounting is very similar from the seller’s view. The seller must allocate a part of its revenue for 10 items to 11th item, too. Customer loyalty program can play a role depending on the delivery and program terms, e.g. does customer receive 11th item in the future time after he purchases 10 items in advance (e.g. you always go to the same hairdresser, you pay 10 times and get 11th haircut free)? Or, do you get 11th item immediately with the purchase of 10 items (e.g. buy 10 chocolates now, get 1 free now)? S.
Two affiliates companies A & B are doing business together and selling and purchasing to each other. At end of year company A wants to give discount for the annual purchase from B company, will these companies treat this discount as other income and discount expenses respectively at end of year?? or they can adjust their purchases (cost of sales) and sales by relevant discount figure? If a vendor is to give you a discount on future purchases because of volume that has been purchased over the course of the year and instead of a discount they gave it in the form of free inventory items, what would the accounting be? Would the accounting for this be that we take the items into inventory at zero cost and when we sell the inventory items we recognize 100% GP? Can you please point me to the guidance? As a settlement discount, my company issue a credit voucher of 2,000 $ (equivalent to 20% of overdue amount) with validity of one year to be used for future service provided by the company. how we should account for this? Did you ever come to a conclusion regarding the accounting treatment in this particular instance? Will you please clarify on subject of Buy 1 Get 1 free. As if a company sale such items at the point of sale, does the company booked the extra free pack in their volumes sold or only realized the additional regular sales incurred due to this offer? Eg. An extra pack free on a box of 12 packs. what volumes does the company reflected, 12 or 13? sure, company needs to reflect 13 packs, because if it reflects only 12, 1 will be missing in stock. But, the revenue per pack is reduced, so that the total revenue for 13 packs is the same as total for 12 packs. S.
My question relates to accounting for a free item received by my company for the purchase of a product, wherein the free item is not the same as the product purchased. An example is when we purchase a subscription plan for cellular phone services, and the seller offers a free cellular phone with the subscription plan. In this case, a service (subscription plan) is purchased but a product (cellular telephone) is the free item. Thank you so much for your advise! Thank you for this great article as usual. A situation that I have encountered, but I don’t know how to account for it. A company (which sells paints from different brands) wants to promote sale of particular brand paints in the summer. On the flyer says from May-July, for every $50 dollar purchase on certain brand paint, one can get $10 rebate upon providing the receipt and submitting it online. If there has been similar past event, should they book a provision? please advise. Hi, thank you for the article, and my question related to the IAS 16 (PPE), when company X buy 110 items of product BB and cost USD 1000000, the vendor gives company A, 12 free items. My question related to the free items, how to account those 12 items in my books. Aly, please read the article. The answer is clearly there 🙂 even with an example! S.
Buyer gets rebate against volume of purchase however, the amount of discount will be received after 6 months of payment of invoice which is un-adjusted of Rebate amount and receivable is probable. Kindly share the accounting treatment for the above situation. One of our client try to count mungbean stock in physical in their two godown. We have some question about this issue. 01. When we purchase mungbean from field in that time we pay per kg mungbean price. 02. Our farmers bring his mungbean in our purchase center. 03. We make 60 kg sack approximately. 04. But any how all sack was more then 60 kg. For Example 61,62, some time 63. 05. After purchase mungbean we stored all mungbean in our grading center. 06. After complete grading work we make 60.750kg per sack mungbean. (60 kg mungbean and 750 gm sack weight -approximately ). 07. In this time we found some extra mungbean. That mungbean also now our stock. Our question how we booked this extra mungbean in our financial statement and stock register. This is for your kind attention. I am waiting for your reply regarding this issue. Thanks for your kind cooperation always. would it be calculated on net sales or gross sales (sales + sales disc). ‘A’ sold to ‘B’ 10 Free goods; how will ‘A’ account the sales tax ? Usually, this goes as cost of free goods to inventory. I receive FOC Tiles from my Supplier as reimbursement for Tiles used from my Stock for Showroom Display. Such used tiles had been written off towards the Showroom expenses. When I get FOC (Free of cost) tiles can I pass the following entry. Please advise if this is legal or acceptable as per Accounting standards and where can I find that it is acceptable ? Your urgent reply in appreciated. Hi Subbu, no, that’s not the way. You should keep your stock at lower of cost and NRV. Free tiles reduce unit cost per tile. If you dispatch stock in weighted average, then the free stock will naturally decrease the cost of sales per tile. S.
Hi I am currently auditing expenses of a grain handling terminal. They give discount to their customers if they lift their consignments from the silos (storage) of the company within 8 days. The company recognize it as an expense in its accounts (if a customer avails this discount) and as a liability that it owes to its customers and deducts it from its future invoice. Thus discount is treated as an expense and this discount is deducted from a future invoice not on consignment on which the customer availed discount. We have a sales contract to a client including a discount for a marketing cost. How to allocate a marketing cost based on the sales? -Do we allocate the discount to reduce the Gross margin? Hi Adil, you need to present the sales revenue net of any discounts… that is, after deducting the “marketing cost” discount. This is just in general, but of course, it strictly depends on what is written in the contract. S.
Our vendor is giving us a subsidy with condition the vehicle purchase must be treated as a demo car and hold it for at least 2 years before disposing it as sales of used vehicle. In this case, the cost of the vehicle to be recognized as fixed assets shall be the original cost or the cost after subsidy (net)? The subsidy amount is 40% of the vehicle cost and will be received upon the purchase of the vehicle. However, there is a clause stating if the vehicle is dispose off within the 2 years, the subsidy will be forfeited. Considering there is a present obligation (hold as demo car for 2 years) arises from past event (purchase of car), what is the cost that should be recognized? We receive a 5% discount from our supplier if we pay the invoice within 60 days from invoice date. Cashflow determines our ability to pay at 60 days. Due date dafaults to 90 days without discount if we miss the discount date. We would have sold all the related inventory within a few days of being invoiced by the supplier. What is correct in this instance? 1) Assume that the discount will be received and reduce the inventory cost by the amount of future discount when the inventory is recognised, thereby reducing cost of sales as the inventory is sold. 2) Record the discount received when we make the payment by the required date by crediting cost of sales at the date of payment, or by crediting an other income account. It’s especially problematic over year end where recognising the discount in advance would potentially inflate profits at year end. The discount amount would exceed audit materiality. Your article and answers to other questions advise crediting inventory but in our case the inventory is long gone before the discount is earned. I need your advice. The company provides customers with a general coupon like “get $25 with any purchase of $200”. Does it look right that net sales for the same item X depend on customer basket? – On reaching a invoice threshold value say $ 100, a discount voucher of $ 10 is issued, that can be redeemed on next purchase. The promotion validity is 40 days. – Redemption is subject to minimum spend of say $ 40. – Redemption is NOT subject any minimum spend. Customer can redeem the coupon against the next invoice value of $ 10. Hi Sunil, maybe this article will bring some light into accounting for these discount vouchers. In relation to the “minimum spend”, only the probability of redemption and expected amount of redemption will be affected and accounting is the same. Please take a look to the article in the link – you will find some practical examples there. S.
We are a hotel with a water park and give away free vouchers for overnight stay and water park as donations for worthy causes. How do we account for this. No value until redeemed. Incurrs a loss as we have housekeeping expenses and no income. Hi Jeniffer, I think that this article might help. Best, S.
Thanks for the very informative article! I wonder if I could ask for your input on my situation? Our company provides IT security services and some of our 36 or 60 month monitoring contracts include a bank of time towards professional services free of charge (eg. 5 days towards a vulnerability test). It’s basically a liability for our company since we owe these free services to our customer and there is a cost associated to that, but I am stumped as to how to account for this correctly under IFRS15. I have an question on free gift. If I order stationery for $1,000 in total, the vendor give me a supermarket cash coupon of $50 as gift (which is unrelated to the products of the company). How should I record the free gift in my book? Thanks Silvia for this article.It really answered some of my questions.However,the issue of target-based incentives and financing of assets like vehicle from vendor incentives were not addressed.Could you kindly say something about how they should be treated? Many thanks for your great work! A quick question: lets assume we are buying a certain product from our supplier for $ 90 and normally, the selling price for this product is $ 100. Then, we have agreed with the supplier to launch a special campaign where the selling price will be reduced to $ 95 and the supplier will compensate us for this price reduction of $ 5. In this case; what should be the proper treatment under IFRS 15? Should we recognize $ 100 as sales revenue, or should we recognize $ 95 as sales revenue and $ 5 as other income? I have a question about a tricky example that I have encountered in one of the mock exams. The example is hypothetical so I might not know all the details regarding the entity. Let’s say there is an entity (reporting year end is 31/03/2018) that provides transport services, it received a building from a PRIVATE individual in February 2018 under the condition to turn it into a train museum for the benefit of the local community or the asset (or a sum equivalent to its Fair Value) must be returned. The Fair Value of the asset was $3 million in February 2017 (1 year ago). However, the entity couldn’t utilize the building under the condition until May 2018 as the building needed some refurbishment and adaptation of $1.5M. The building contributed by a private individual is a resource provided under the condition that doesn’t meet Non-current asset recognition criteria (IAS 16) – cost can be reliably measured but it is not quite sure that it will bring FEB to an entity because it would be held for non-for-profit purposes. Also, the initial cost is questionable because it was assessed a year ago so I think that entity should re-measure the fair value before recording the building in its books. How should an entity record such a building before the condition was me? And also how should it be treated after all refurbishment works were made and the asset was ready to function as a Museum? Or there is another treatment? Unfortunately, I couldn’t find an applicable standard, IAS 40 doesn’t apply here because contribution was made from a private individual, not from a Government, however, I believe that treatment should be similar. I have been regularly following your articles and they are very insightful and useful in clearing several doubts about accounting various transactions. Keep up the good work. We are an automobile dealer and as part of our anniversary celebration our customers are automatically entered into a raffle draw that gives them a chance to win 5 vehicles during the promotion period. Should the cost of the vehicles be account as Marketing expenses or should it be treated as Cost of Goods Sold. A clarification on the matter would be highly appreciated. Company A has a deal with company B saying that: if the purchases of A from B within a year reaches CU 100,000 “Target” A will get Free Of Charges materials equal to 10% of the purchases..
How company A will record the daily purchases as company will not be able to know if it deserves the Free items or not? And what are the treatment scenarios in case of achieving the “Target” or not? Very nice and informative article. Just a quick one, for a construction company, applying this standard for the very first time using the modified approach, what kind of basic adjustments to opening balances are expected? Hi Hasnain, that’s not the quick one. I wrote an article about construction contracts under IFRS 15 here and the adjustments depend on your specific transactions. Sorry, I cannot answer this question in general. Very interesting article to read. I wonder what would be the journal entry in case trade discounts were based on free goods upon achieving a target of purchases. For example management signed a contract with supplier which stated FOC goods valued CU 100,000 upon purchasing CU 1,000,000 of inventory by the end of the year. Following the requirements of IAS 2 and IFRS 15, if management estimate that it will probably meet the target, the receipt of goods should be credited to a CGS account (in case all purchases were sold) and debited to inventory account as well. Hi great article…i have a simple question, are discounts received ever recorded as revenue?ie a volume rebate at year end, how is this accounted for?